Many visitors to Phra Nang Beach simply go there to soak up the sun, laze on the white sand and admire the stunning Krabi scenery. Flanked to its left and right by the neighbouring beaches of East and West Railay, Phra Nang commands an enviable location on the tip of the headland looking out on the emerald expanse of the Andaman Sea. However, some local people visiting Phra Nang aren’t just there to admire the surroundings. They are there to make offerings to Phra Nang herself, the Princess Goddess who is believed to reside in the cave underneath the cliff at one end of the beach. The legend and mystery of Phra Nang goes back many centuries and the belief in the Princess Goddess still remains strong amongst local people. Phra Nang Cave (Princess Cave as it is sometimes shown on maps) is a sacred place and should be treated with respect by anybody visiting there. Fishermen and boatmen still make offerings in the form of incense and flowers to ensure a safe journey. 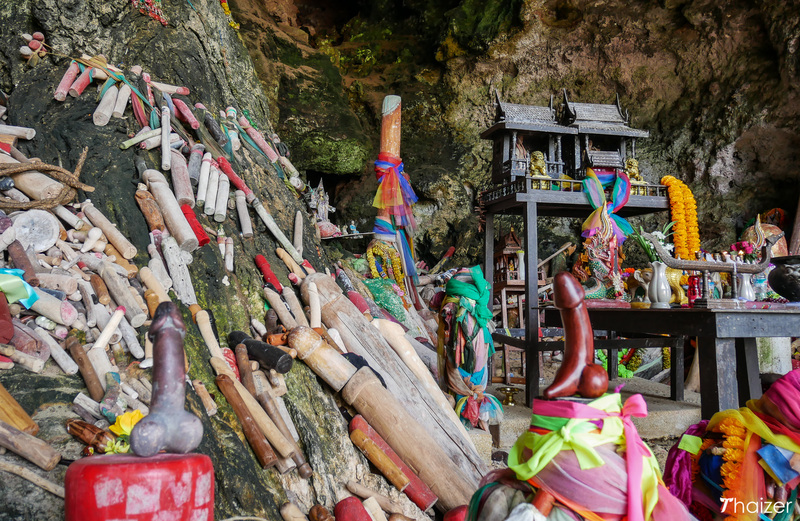 More curious though, are the phallic symbols or lingams that are in prominence at the entrance to the cave. Lingams are a symbol of the Hindu god Shiva and are associated with fertility and virility. In Thailand, Hindu and animist beliefs are incorporated alongside Buddhism. 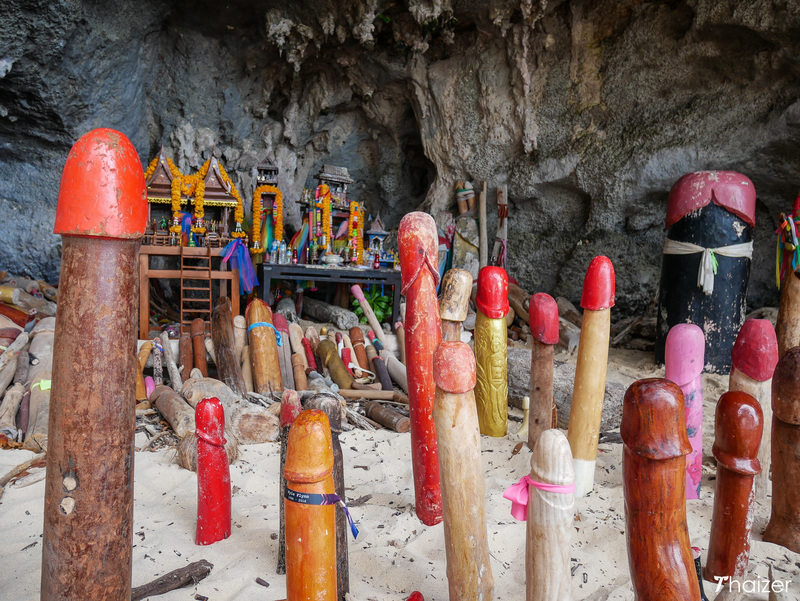 Over the centuries, Phra Nang cave has become associated with fertility and the lingams placed here take the form of carved wooden penises. 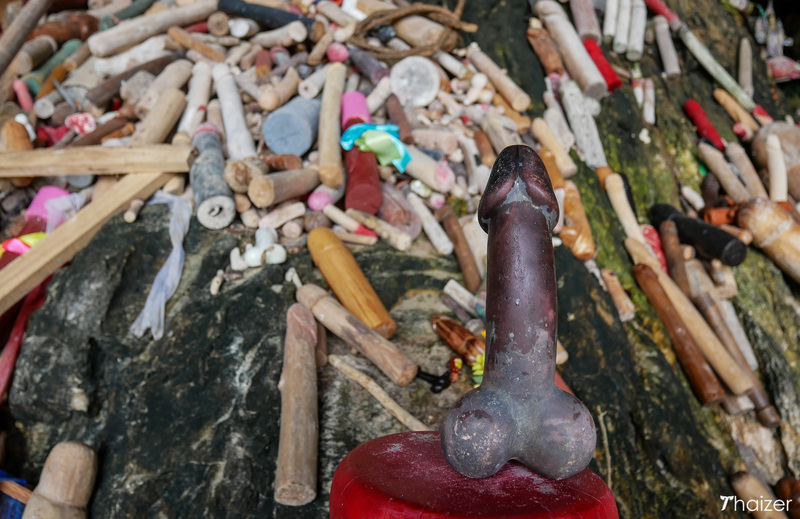 Local folklore says that if somebody carves a wooden lingam and releases it at high tide anywhere along the Krabi coast, it will eventually end up in Phra Nang cave. Another version tells the story of a beautiful maiden who lived in Krabi centuries ago. Her captivating beauty attracted suitors from all around, but she rejected them all. One lovelorn individual reacted angrily when his marriage proposal was rejected and he tried to kidnap the lady, but she was rescued by a brave local man who came to her aid. In appreciation, the lady agreed to marry her rescuer. On the date of the wedding the groom arrived with the traditional dowry, but there would be no wedding. A group of jealous men were there to fight with the would-be-husband. In the fighting that ensued a hermit who had been living in a nearby cave appeared on the scene. His attempts to stop the violence were ignored and he utilised his magical powers to transform the scene into stone. The maiden became Phra Nang Cave. The groom became Chicken Island. Other men involved in the brawl were turned into the various nearby islands including Poda Island. From Ao Nang Beach or Nopparat Thara beach, longtail boats act as shred taxis and can can take you directly to Phra Nang Beach. The fares are set by the Krabi Longtail Boat Association. The current fare is 100 Baht per person one way (200 Baht return). Buy your boat ticket at the official ticket counters at either end of Ao Nang Beach or at the southern end of Nopparat Thara Beach. Longtail boat drivers will usually wait until they have a minimum of 8 passengers before departing. Journey time is a little over 10 minutes. 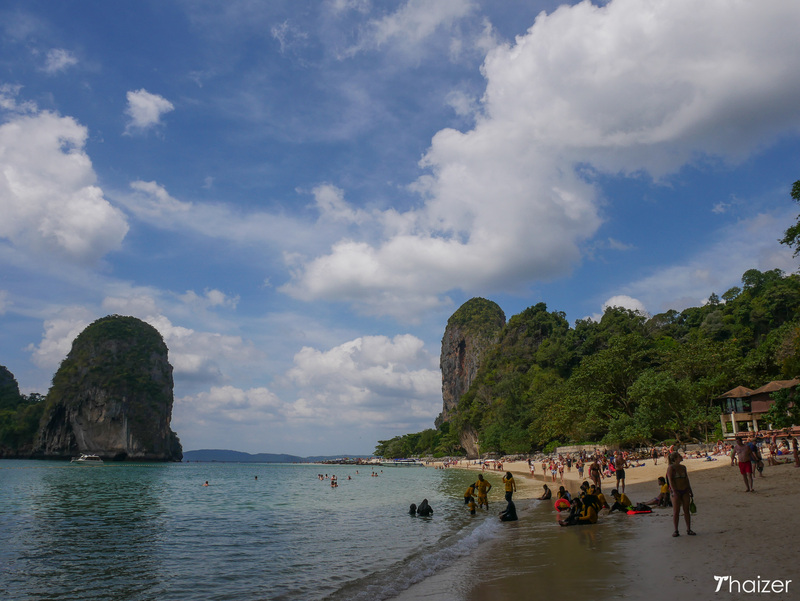 Phra Nang Beach and the cave can also be accessed via East or West Railay. 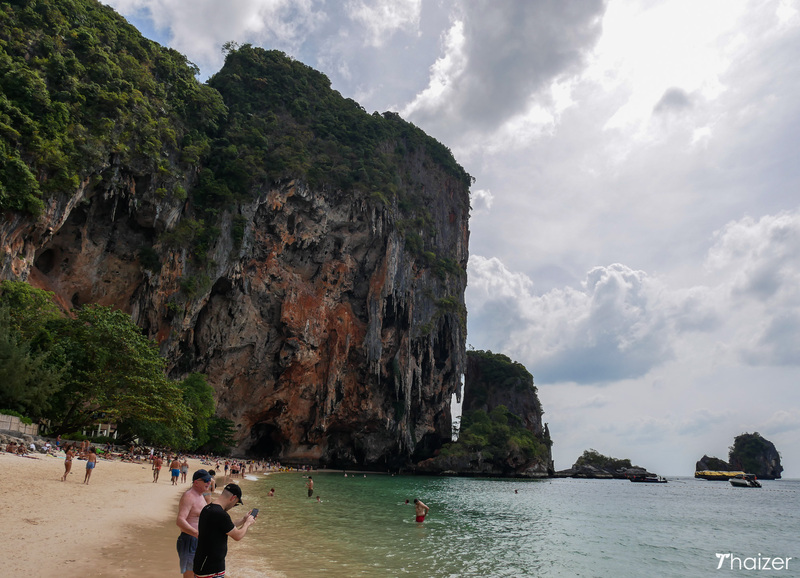 If you arrive at West Railay you will need to follow the walkway through to East Railay and then follow the path along the beach and around the base of the cliff (towards the Rayavadee Resort) until you reach Phra Nang Beach.